Am I Right - Upbeat Songs With Depressing Lyrics, P.O.D. 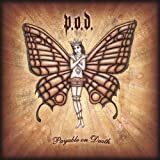 Real Lyrics -> Upbeat Songs With Depressing Lyrics -> P.O.D. Upbeat Songs With Depressing Lyrics, P.O.D. P.O.D. 's, "Youth Of A Nation"
Wish I'd known, 'cause I would've kissed my momma goodbye. The entire first verse is sung from the perspective of someone killed in a school shooting.